How far along are your trees 2019? 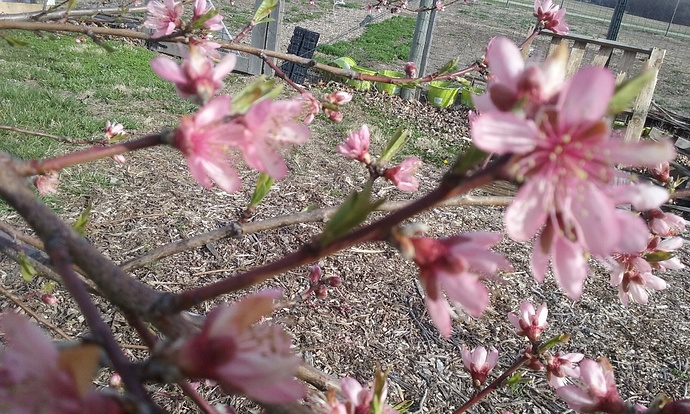 "Better frost resistance and later bloom time than other peaches (even Contender), means TruGold avoids the danger of unpredictable spring frosts, ensuring you a bountiful harvest every year. " The two TruGold peaches from Lowes were one of my first trees to start to break bloom. My Contender trees are still at bud swell. So the TruGold from Lowes definitely does not match the description. I planted one TruGold from Gurneys in spring of 2018. It’s blossoms are still relatively tight and do not match the impostor TruGolds from Lowes. 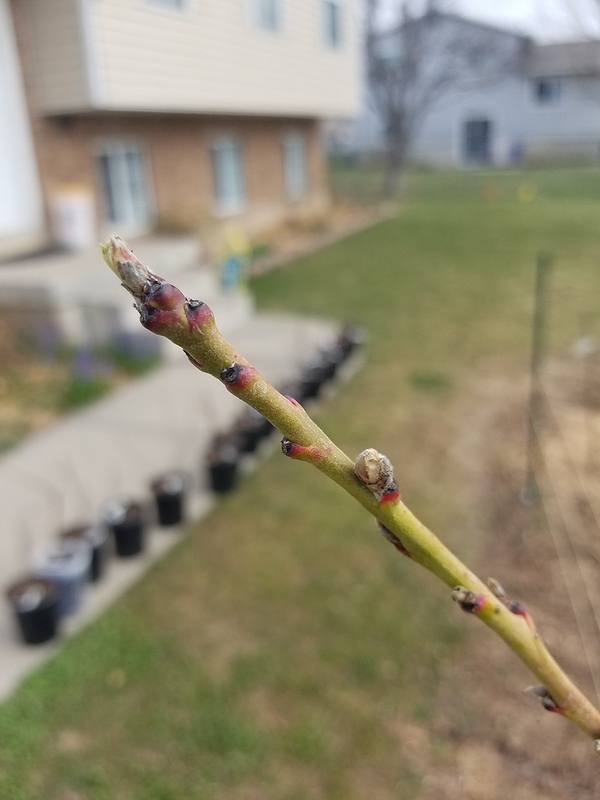 The peach from Gurneys was planted at a different location but I don’t believe location/micro-climate can account for the extreme difference in bloom/bud development. I wish I knew the quality of fruit. I am probably two to three years out on getting a peach. I will pay close attention to the tree this year and see if it is in fact trugold or a mislabeled tree. Potted trees from Lowe’s or Home Depot or Walmart are not going to act like trees that have been in the ground 5 years. So the worry is premature…patience. 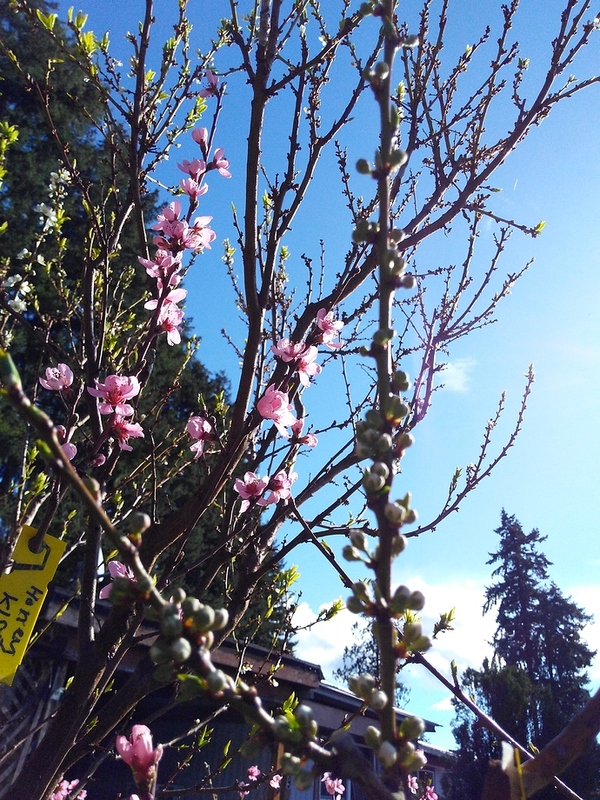 Below is a pic of peach trees. In the front is a small tree which is an Intrepid. To the left and back is a Georgia Bell in full bloom. The large tree to the right is an Elberta. Both the Intrepid and Elberta is just starting to bloom, the Elberta and Intrepid are at least 8 to 9 days behind the Belle of Georgia. I hope I don’t sound like a broken record, but I’m questioning whether your Belle of Georgia really is. Belle of Georgia has non-showy blooms. 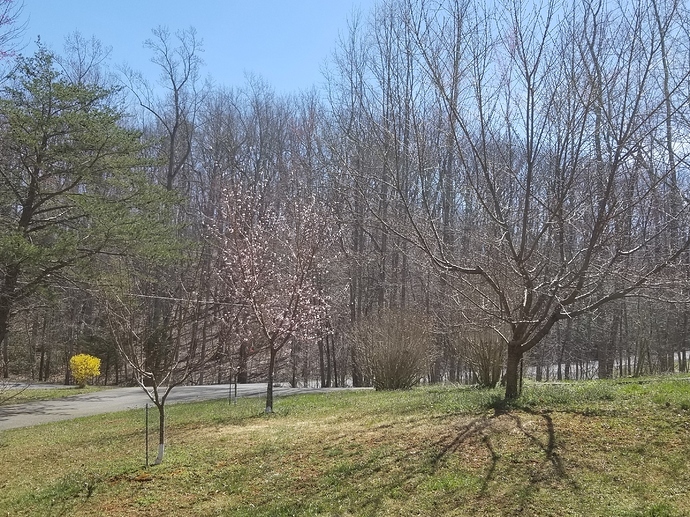 It’s not completely clear from the pic, given the distance, but it looks like the left tree furthest in the pic you are calling Belle of Georgia has showy blooms. To me it has showy blooms. 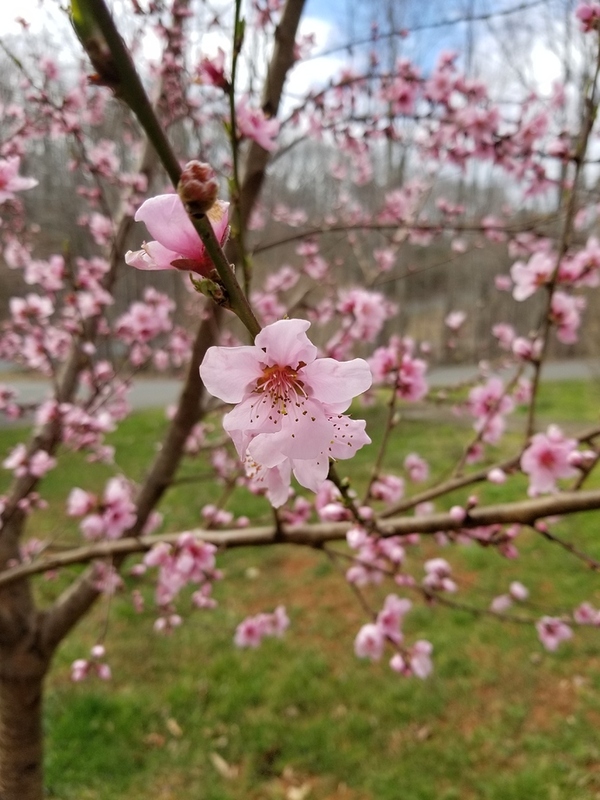 I have another tree that is labeled Belle of Georgia that has similar blooms, blooms the same time and was bought at different times (different years) and is planted at my fathers farm. I will try and get a close up pic tomorrow. The tree pictured is in my front yard and came from Sams Club in 2016 and was labeled from Simpson Nurseries. Belle of Georgia has non-showy blooms. If you are in any doubt, the fruit has very little red color and drops something horrible. I grew one tree years ago. It produced heavily, but bruised and dropped so badly it wasn’t worth it. 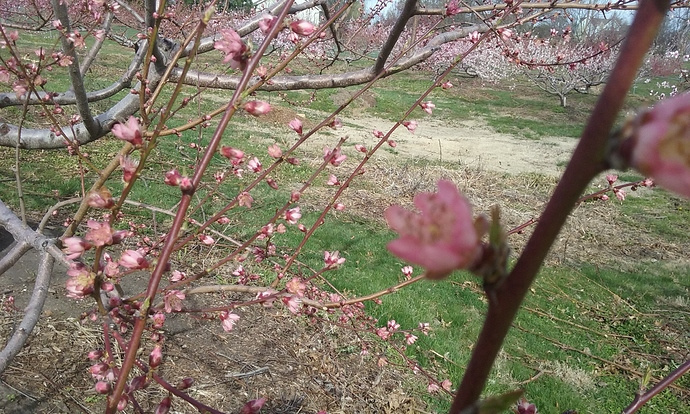 Most of the stone fruit trees have been in full bloom for a few days,except for some, like Toka,Vermont and this one,the Broken Heart Plum. See pics of blooms below, they are definitely showy blooms to me. So I assume not Belle of Georgia … Sigh. It will be interesting to see if the tree sets fruit this year. It set fruit the first year (like one peach, I don’t remember flesh color). I am looking at one night of 30 degree, one night of 29 degree weather and then hopefully I am in the clear (35 degree or higher) of frost damage. If it does not produce this year and my other trees do it will be cut out, same for my Hale Haven and Coral Star. They never set fruit. So I am up to one Red Haven, one Belle of Georgia, two TruGold and likely one Surecrop that were mislabeled. Plus one Red Haven ordered and received a Benton Cherry instead. I hope I do not find many more mislabeled, I planted a lot of trees this year. Thanks for your help Olpea, I really appreciate the insight, suggestions and help. I’m sorry you’ve had such tough luck on labeling, but for sure you can count the Belle of Georgia mislabeled too. Belle of Georgia may be the most commonly mislabeled peach out there. I’ve even read some growers label any white peach as Belle of Georgia because it’s so recognizable. The good news is that Belle of Georgia is a pretty poor white peach (although productive). So if you can get any white peach a notch above (not hard) that’s a plus (if it will produce regularly). For sure you haven’t cornered the market on mislabels. I’ve had so many mislabels I have lost track through the years. A couple that have worked out are a White Princess peach mislabel that has turned out to be a double red (skin color) yellow fleshed peach. It’s not the most consistent bearer, but what it produces is a very consistent (quality wise) high sugar yellow peach. I just got through cutting down the original tree (15 growing seasons old) but I have 4 copies left over. 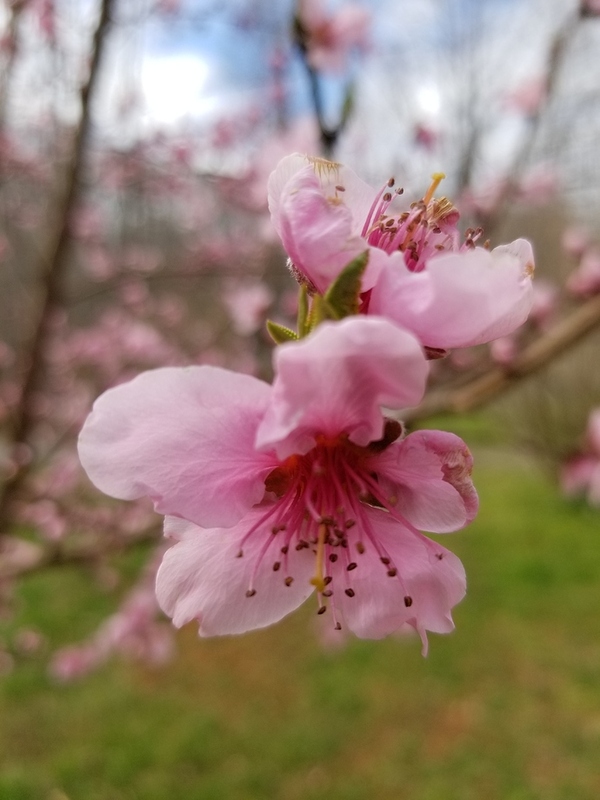 One of the mislabels I got from Adams County was supposed to be a Galaxy peach, but turned out to be a Spring Snow (90% certain). It’s been one of the most flavorful white peaches I’ve grown. I made about 20 copies of that one a couple years ago. They aren’t yet producing, but when they do, the fruit will be delicious, like the mother tree. These are the successes, I’ve had 10X the failures from mislabels. Last year I had to pretty much start all over after I lost 4 trees. I’m not ready for another dead tree this year. 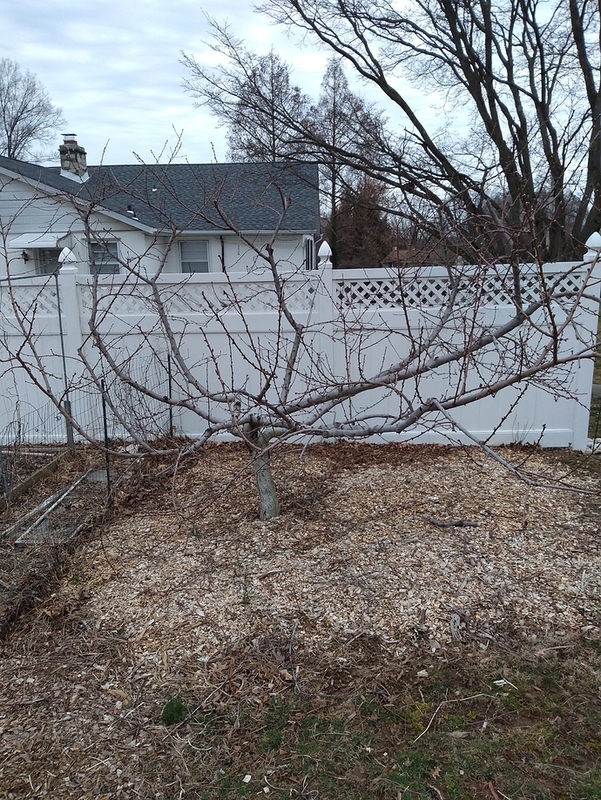 Anybody else in my area with fully dormant peach trees? @growjimgrow? No Susu, both my peaches are starting to form buds. They are clearly progressing. Sorry. Oh that’s bad news. I was hoping to hear that varieties I grafted leaf out late or something. Wickson is my furthest along apple tree. @Susu I’m in Lancaster county. 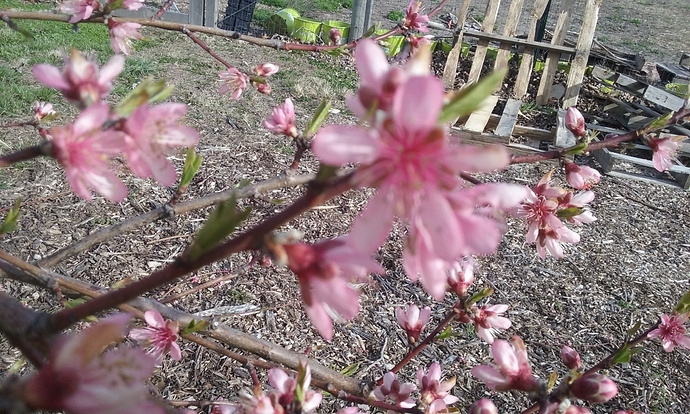 My Intrepid peach I planted last year has flower buds starting to swell but leaf buds are still pretty tight. The lows we’ve been getting on some nights has really delayed some of the trees. 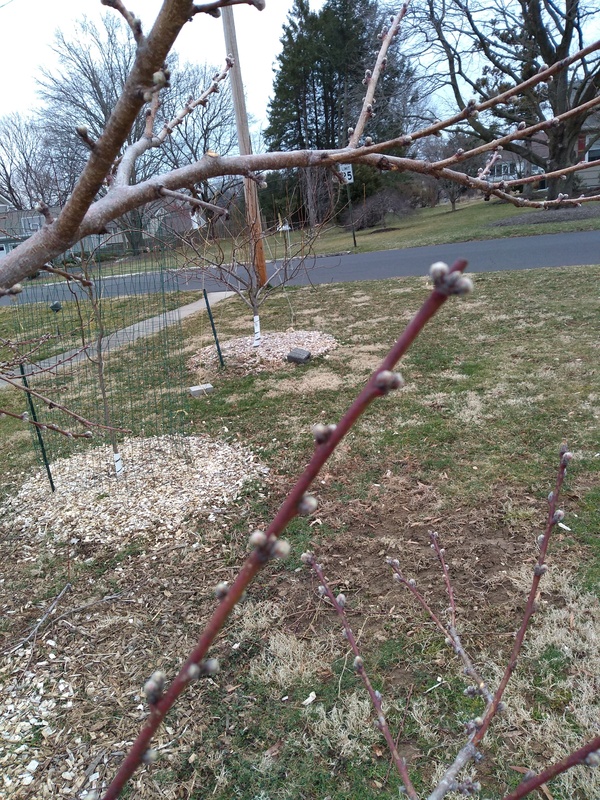 My Nanking cherries would have normally bloomed already but are just starting. Thanks PharmerDrewee this gives me some hope. 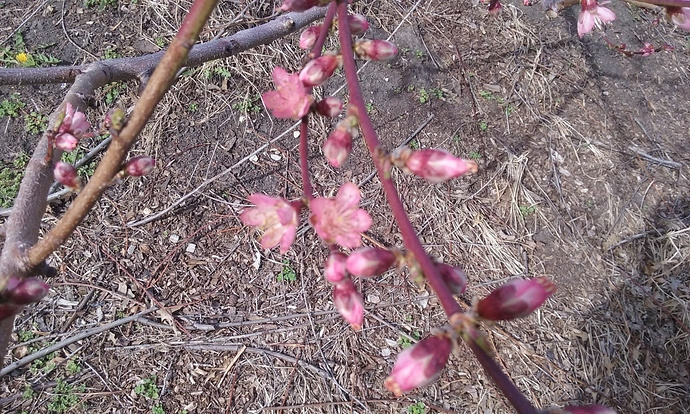 I hope the tree doesn’t have any flower buds and the leaf buds are just dormant because of the variety. I guess I’ll know for sure by next week. Those are definitely showing signs of life. 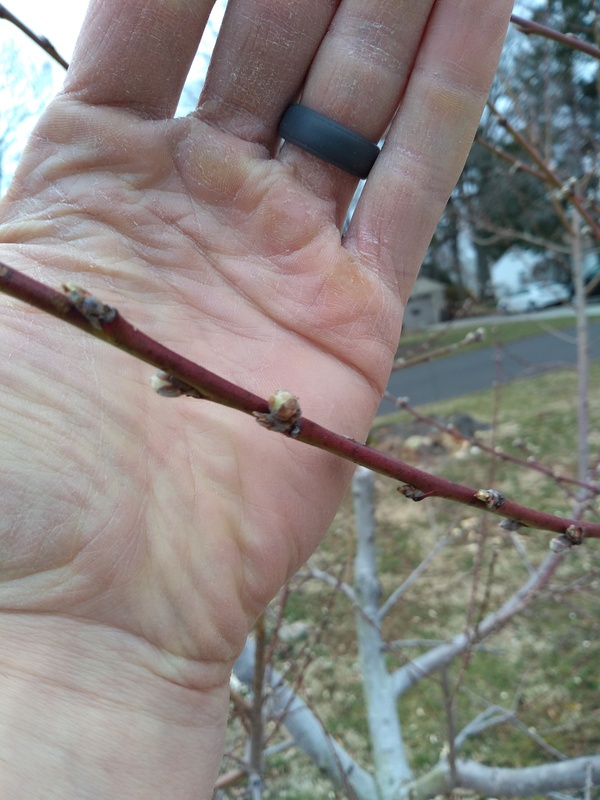 I walked over to my possibly-dead peach tree this morning and pinched off more buds. Still green. One even had a tiny bit of pink. Could’ve been a flower bud. If it was a flower bud it should’ve been budding out by now. I’m starting to fret again thinking it died recently. I think I’m going to ignore your buds and wait for my tree to wake up…late. It’s interesting Olpea, I did more research and some reference Belle of Georgia as having showy flowers. I am sure the real Belle of Georgia was non-showy as your references stated. This “fake” Belle of Georgia has shown no signs of being frost hardy or productive. 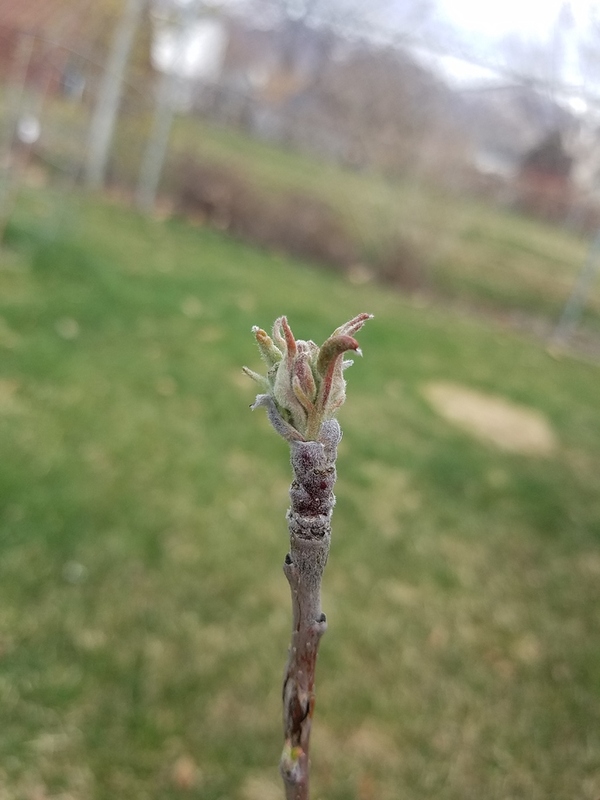 This will be a good year to see how it sets fruit - 4th year in the ground and some temps in the mid to upper twenty’s during bud break and bloom to see how it handles cold temps and frost. I have enough trees in the ground that i can start removing ones that don’t set fruit. It’s interesting Olpea, I did more research and some reference Belle of Georgia as having showy flowers. I am sure the real Belle of Georgia was non-showy as your references stated. There is a fair amount of misinformation about peach varieties. It doesn’t surprise me especially with Belle of Georgia. I remember when I did try to sell a few Belle of Georgia peaches, a customer specially requested some because he said they were the favorite white peach of him and his wife. When I actually showed them some Belle of Georgia, he said the ones he got were much bigger (The real Belle of Georgia isn’t a large peach). He bought some and was disappointed in the flavor compared to the other Belle of Georgia peaches he bought from someone else. The reality was that he didn’t buy Belle of Georgia peaches before. They were a mislabel. I found this pic I took of some Belle of Georgia peach blooms I posted on an old thread three years ago. This was not my Belle of Georgia, but one that my church had. It was labeled Belle of Georgia and I saw the fruit, which is pretty distinctive. Some people who may not be familiar with showy vs. non-showy peach blooms, may classify this as showy. But notice how the petals point out more away from the base. This is in contradistinction of your photos which show the petals laying more flat (or opening up more). Also notice how the petals in my photos are smaller than the ones in yours. Those designations make Belle of Georgia a non-showy bloom.